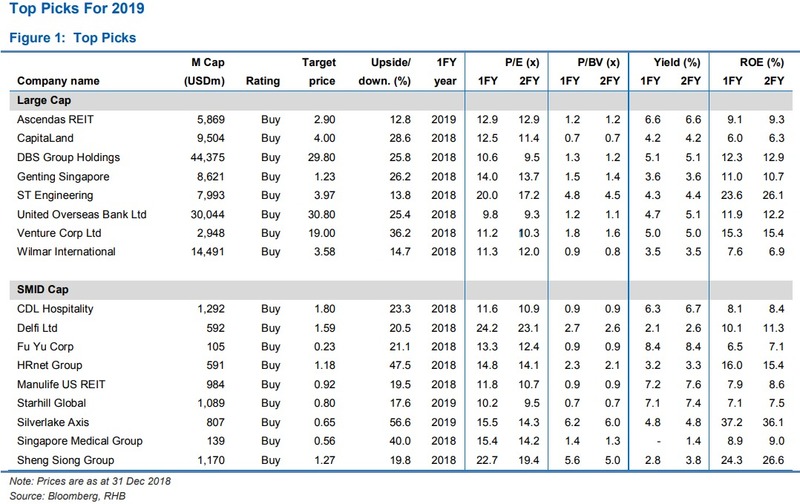 SINGAPORE (Jan 2): RHB Research prefers to stay selective and defensive amid growth uncertainties in 2019. The Straits Times Index (STI), down 12% in USD terms, could remain under pressure this year amid slowing GDP growth and an uncertain trade outlook due to China-US tensions. Amid the uncertain economic outlook and elevated market volatility, the analyst prefers defensive sectors, such as consumer and industrial. Sector rotation into defensives. RHB studies have shown that industrial and consumer sectors tend to outperform the broader market after the peak of economic growth in Singapore. RHB’s top picks include Sheng Siong and Wilmar in the consumer sector, while ST Engineering is preferred among industrials on revival of its profit growth. Remain “overweight” on banks. Despite lower loan growth, banks offer about 10% growth and 5% dividend yield, but there may be limited downside risk after the recent price correction. RHB prefers UOB for its reasonable valuations and the likelihood of higher dividends. Selective REITs. REITs that are beneficiaries of improving economic activity and have strong balance sheets are preferred. RHB likes the industrial and hospitality REITS, with Ascendas REIT and CDL Hospitality Trusts as top picks. Opportunistic small-medium cap ideas. The research house expects Silverlake Axis, HRnetgroup, Fu Yu and Singapore Medical Group to deliver strong returns in 2019. “While stocks could certainly move lower-to-sideways from here, we believe this is not a time for investors with long-term horizons to abandon risk assets. We view the current sell-off in the Singapore market as an opportunity to buy into defensive sectors – we define defensive stocks as ones with strong balance sheets, stable earnings growth, high but stable dividend yields, and low historical propensity for big price declines,” says Jaiswal.